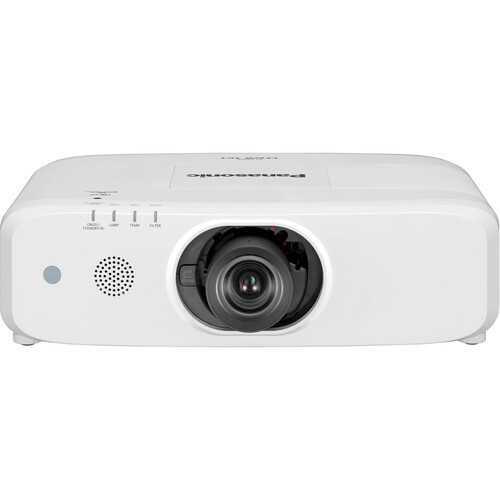 Enjoy bright images in most settings with the Panasonic PT-EX620LU 6200-Lumen XGA 3LCD Projector. It features up to 6200 lumens of brightness and a 10,000:1 dynamic contrast ratio, which work together to overcome light in most rooms and provide detail in dark areas of the image. Additionally, this projector sports XGA 1024 x 768 native resolution for viewing detailed pictures or data. No lens is included with the PT-EX620LU, and one must be purchased separately. The PT-EX620LU features 5-BNC, VGA, RCA composite video, and two HDMI inputs. It is controllable via Ethernet, RS-232, or the included IR remote control. With up to 6200 lumens of brightness, the PT-EX620LU can produce clear images even in rooms with high ambient light. The 10,000:1 dynamic contrast ratio is enabled by an iris mechanism, so whites are brighter and blacks deeper with minimal loss of detail in dark images for comfortable viewing. The PT-EX620LU features a native resolution of XGA (1024 x 768), but supports resolutions up to Full HD for detailed image reproduction. Daylight View Basic uses a built-in sensor to measure ambient light and calibrates image projection to suit, enhancing brightness and halftone color while sharpening details for easy-to-see pictures in well-lit environments. The PT-EX620LU offers a DICOM Simulation mode that allows the projector to simulate the results of devices compliant with the Digital Imaging and Communications in Medicine (DICOM) Part 14 standardized display function, for display of grayscale images. The DICOM Simulation mode, which supports both Blue and Clear Base, adjusts the gradation between the minimum and the maximum luminance, so gradation is distributed optimally. This feature is optimized for displaying medical images such as X-rays, CAT scans, and MRIs, making the PT-EX620LU useful for non-diagnostic purposes such as lectures, academic meetings, and hospital conferences. This feature is recommended for use in medical schools for training and educational use only. The PT-EX620LU features a DIGITAL LINK connection that supports transmission of Full HD video, audio, and control signals through a single Cat5e (or higher) STP cable for distances up to 492'. An optional DIGITAL LINK Switcher or Digital Interface Box allows for source devices to be connected and signals routed to the projector via one cable, saving installation cost and simplifying the A/V system. The adjustment range of the powered lens-shift function helps assure convenience and versatility during installation. Zoom and focus can also be adjusted via the remote control. A lens is required and sold separately. Horizontal, Vertical, and Corner Keystone Correction adjust the image shape for clear visibility when projecting off-axis or from an unusual angle. Curved Screen Correction allows for the projection of distortion-free images onto curved or cylindrical surfaces. Choose from a selection of optional lenses for your system. The lens options make it easier to adapt the projector to the installation site. Lenses are designed to attach and detach with one-touch ease. A lens is required and sold separately. A mechanical lens shutter prevents light leakage when the projector is on standby mode or temporarily not in use, such as periods during meetings. The optional ET-WML100 wireless USB module enables projection of a variety of media via Windows computers, iOS devices, or Android devices loaded with an appropriate app. You can also display content from more than one device at a time in Multi-Live mode. Presenter Light for Windows computers allows you to project stills, video, PDF and PowerPoint files, and other media from your computer screen directly through the projector. Up to four computers can be projected simultaneously. VueMagic Pro for iOS and Android devices allows selected still image and document formats, including PDF files, to be projected. Live Camera mode and Annotate mode are featured, and images from up to four devices can be projected simultaneously. With support for PJLink Class 1, Crestron Connected, AMX, and RS-232C over wired LAN, virtually any legacy unit can be swapped out for a PT-EX620LU projector without disrupting existing control and management infrastructure. Emulation via RS-232C allows your original settings to be preserved. In addition, Multi-Monitoring and Control software are available for monitoring and controlling multiple Panasonic projectors from a single computer. The PT-EX620LU projector features a lamp replacement cycle up to 5000 hours with the lamp power set to Eco mode, or up to 4000 hours with the lamp power set to Normal mode. The PT-EX620LU is designed to protect against dust intrusion with a one-way airflow design and enhanced sealing for the lens block, air intake duct, and Eco Filter. The electrostatic Micro Cut Filter is engineered to capture dust particles and requires no maintenance for up to 15,000 hours. It can also be washed and reused. It is designed to maintain brightness for longer in high-traffic environments while reducing servicing costs. A variety of Eco Management functions are accessible via a button on the remote control. These include brightness optimization for ambient lighting conditions and lamp power reduction when no input signal is detected. The quiet design reduces operating noise to just 29 dB in Eco mode. To reduce hassle, the filter can be replaced via the side and the lamp from the top of the projector. There is no need to remove the unit from its ceiling mount for periodic maintenance. Box Dimensions (LxWxH) 25.0 x 21.5 x 11.1"